Come and join The Adventure Cafe Team for 2 unforgettable weeks of Adventure in the Himalayas, biking into territories unknown, and little visited by Western Tourists. We shall cover the Kathmandu Valley, the middle hills (absolutely towering peaks!) and then down to the plains on the Indian Border, before climbing up into the Annapurnas. We begin in the Kathmandu valley, and then venture further afield, out into the wilds of the country. Our journey will take us all around the famous Kathmandu Valley, exploring Nepalese culture in a way unlike any other you are likely to find. From the Valley we shall make a crossing of the Chure Hills—up to an altitude of 2400m, before an awesome descent down on to the plains—where we shall spend a night in Chitwan National Park. Visiting tiny temples, witnessing the amazing wildlife of the region, getting up close and personal with village life, and of course, not forgetting some awesome singletrack, and adrenaline fuelled downhills – this is a trip not to miss! From Chitwan the challenge really begins - as we wind our way through to Pokhara and then onwards up into the Annapurnas - where we are surrounded by high Himalayan Peaks. This is Adventure Biking at its very very best, with cultural exploration, physical challenge, and landscaped unparalleled in the world. 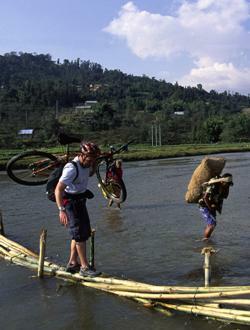 Day 3 - Depart Kathmandu by bike! Out of the Kathmandu Valley and down to the Trisuli River, before climbing to Daman. Day 4 - Continue from Daman to Hetauda - a gentler day today as we recover from our first big mountain day. We spend time descending down to the plains - with time to stop and look around. Day 5 - Cycle from Hetauda to Sauraha - to visit the Chitwan National Park - if time permits we may have time to see the famous Chitwan Rhino in the evening sunshine - from the back of an elephant. Day 6 - Ride to Butwal - a bustling market town near the Indian Border. From here we shall begin our climb into the central Himalayas. Day 7 / 8 - Ride to Pokhara - climbing over the middle mountains and down to everyone's favourite Nepalese town - nestling beneath the Annapurnas. Arrive in time to enjoy a relaxed evening. 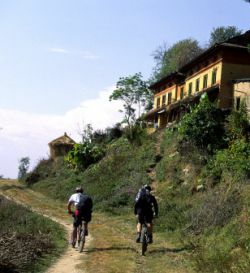 Day 9 - Start the ride up into the mountains - heading towards Naya Pul - the beginning of many high mountain treks. Day 15 - International Flight Home. Distances Covered—Will vary considerably, from just 40km (dirt track) up to a challenging 120km. Our accommodation in Kathmandu is local 2-3 star standard and is comfortable, clean and with en-suite facilities. Once out of Kathmandu our overnight stays will vary considerably from Tea Houses to comfortable hotels. We shall not use tents during this expedition—hence you do not need sleeping bags, and we shall always have food provided for us in the evening. Our expedition is exploratory in nature, and the exact routes may change dependent upon group requirements. Above all, this is an adventure tour, and getting to meet local people in a non-tourist environment is a key part of this journey! Please be aware that this region does contain tropical disease, and you will need to be innoculated before travel. Your GP surgery will be able to provide you with the innoculations. Also Anti-malarials will have to be taken on this event. This trip can be joined either for 10 days or the full 15 days depending upon how long you can give up to this amazing adventure ! All British nationals require a Visa, this can be arranged on arrival in Kathmandu. If you require further information please don't hesitate to contact the Café. Includes—guide / mechanic/first aider/first aid supplies, all accommodation—bed and breakfast, vehicular back up for the trip (at times when vehicle can reach us! ), guided tour of Kathmandu City. Internal flights. Excludes International Flights—although you may wish to discuss how to go about booking your flights with Adventure Café to ensure that you get a good deal. Evening Meals, Lunches, VISA fees, soft drinks, alcoholic drinks. One of the most fascinating things about Nepal is that in the space of a hundred miles you can go from the coldest and most bitter conditions on earth to the sweltering heat of the North Indian Plain. In general it’s best to plan for temperate conditions ranging to around freezing on most trekking itineraries. Temperatures in the daytime range from +5—+20 degrees Celsius, with evenings being 8 to 10 degrees cooler. The best times of the year by far are the spring and the autumn. Whilst it is possible to trek during winter—it’s a little cold for most people. The monsoon is not fun—as paths are washed out, it’s exceptionally humid, and you’ll spend a lot of time wet through! Most people are surprised to find that Nepal is actually the same latitude as Florida or Egypt, the extremes in temperature and climate are all do to altitude variations. In November, when this ride is planned expect warm weather on the plains, and coolish weather whenever we climb up above 2000m.